Let's face it (pun not intended) – we aren't getting younger. 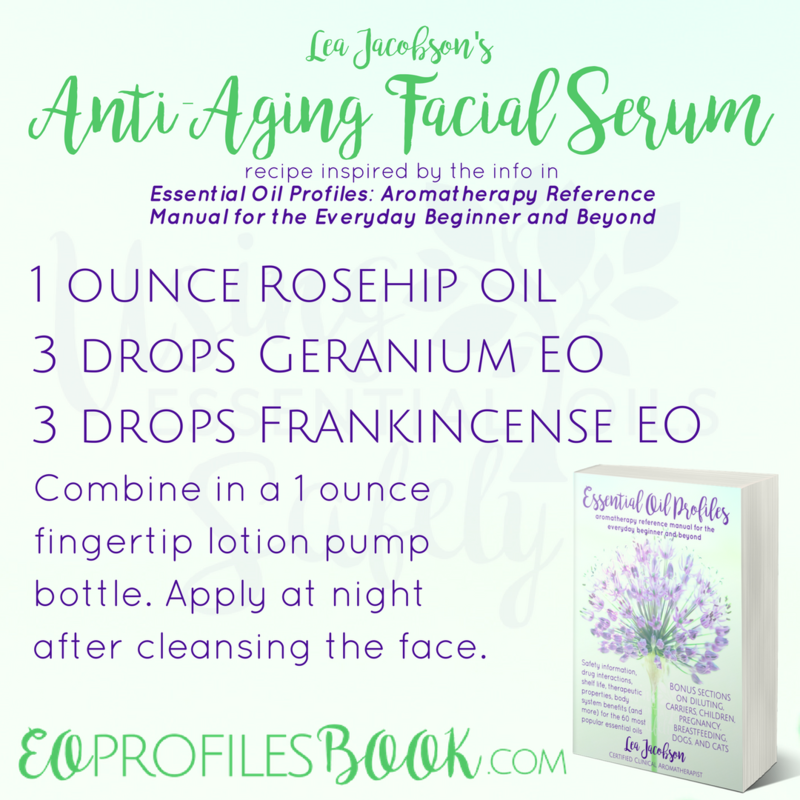 Essential oils have a lot of things going for them, and “anti-aging” is high on that list. 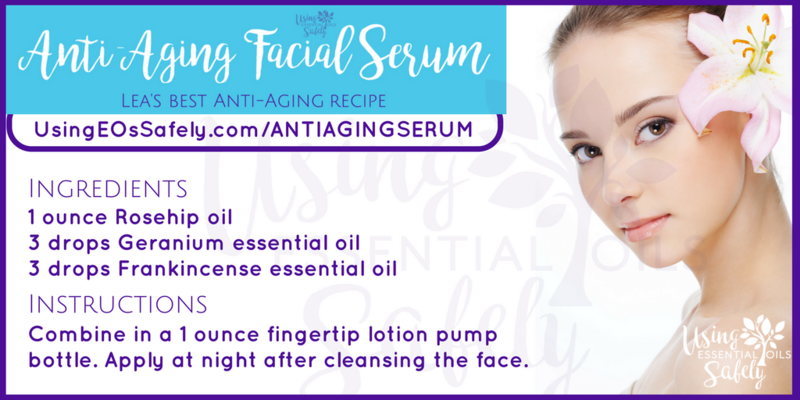 When used topically, some essential oils – such as those in the recipe below – can help combat aging. 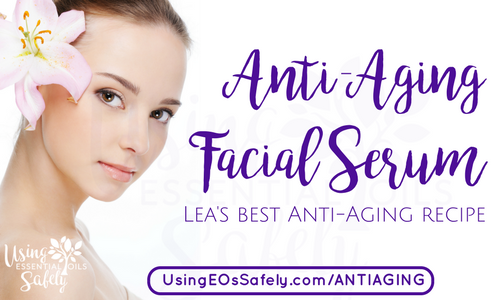 Combining with a carrier oil (or oils) containing the same anti-aging therapeutic properties allows synergy to take place. This synergy works on the skin to reduce the appearance of wrinkles, cleanse the skin of bacteria, improve elasticity, and more. This is a 1% dilution according to my dilution chart over on Diluting Essential Oils Safely. Keep scrolling to find out more detailed information about this recipe, which should answer any questions you may have about this recipe. Combine in a 1 ounce fingertip lotion pump bottle. Apply at night after cleansing the face. Q: I don't have Frankincense. Is there another essential oil I can use instead? A: Although the recipe above is the best I can provide, if you wish to substitute something for Frankincense, you can use Myrrh (not pregnancy safe), Helichrysum, or Sandalwood (Australian). Q: I don't like Geranium. Can I use something else? A: Although the recipe above is the best I can provide, if you wish to substitute something for Geranium, you can replace with Clary Sage, Jasmine, or Rose. Q: I don't have Rosehip oil. Is there something else I can use instead? A: Although the recipe above is the best I can provide, if you wish to substitute something for Rosehip oil, you can use Argan or another one from our Carriers page. Q: Is this safe to use every night? I thought you recommend not using the same essential oils on a daily (nightly) basis. 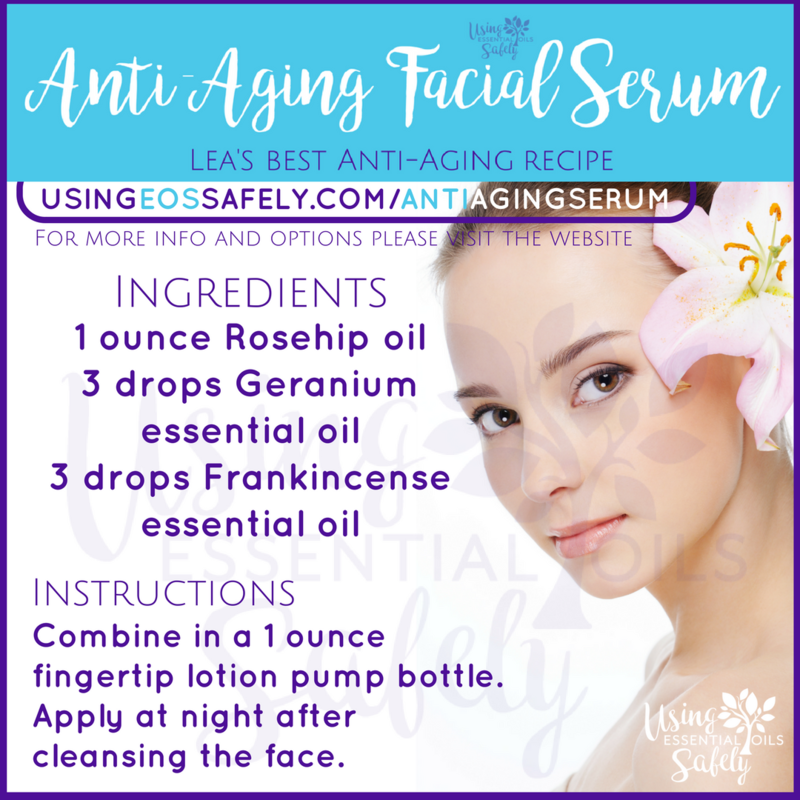 A: The dilution is low enough (1%), that the risk of adverse reactions is minimal, but it's never a bad idea to take a week break after using a few weeks – or rotate with other anti-aging essential oils. Q: Is this recipe safe for use during pregnancy? A: Yes! For more information on essential oil safety during pregnancy read: Essential Oils and Pregnancy. Q: Is this recipe safe for use if I breastfeed? A: Yes! For more information on essential oil safety during pregnancy read: Essential Oils and Breastfeeding. Q: Is this recipe safe for use on children? A: I'n not sure this is suited for children, but yes! 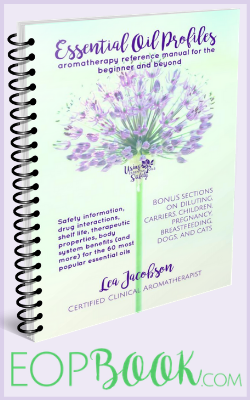 For more information on essential oil safety with children read: Essential Oils and Children. Q: The bottles you recommend are glass, but I only have plastic on hand. Is it OK to use a plastic bottle? A: Pure essential oils should be stored in glass, but when essential oils are diluted in a recipe like this, you can use plastic (PET plastic is ideal) if you wish. Q: What brands do you recommend for this recipe? 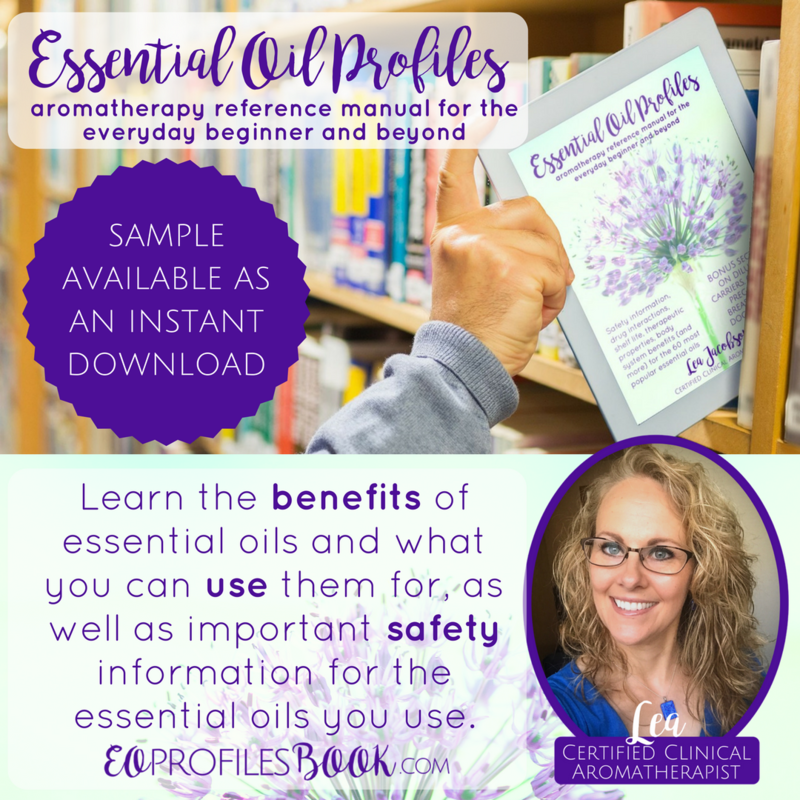 A: I personally use several different brands of essential oils with great results (you can find my opinion here. You can use whatever brand you have on hand, as long as the Latin names match.